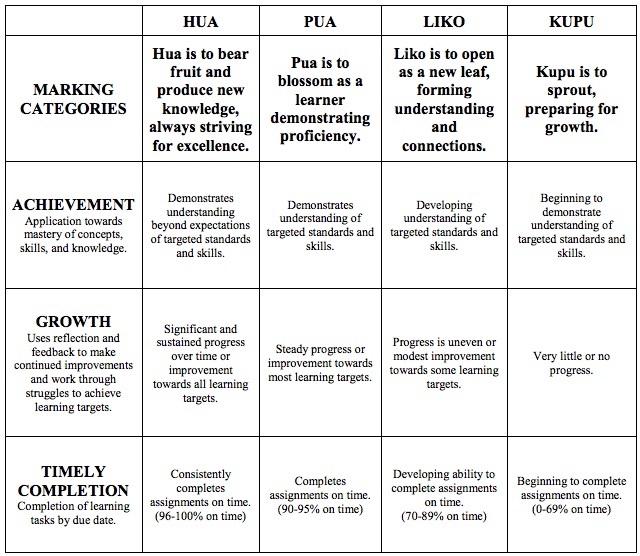 Holomua Interdisciplinary Unit – Haumāna learned about learning style preferences, emotional intelligence, study skills, time management and S.M.A.R.T. goals. Field Trip to Ka‘iwakīloumoku – Haumāna made pa‘i‘ai, learned about ‘ōlelo no‘eau and the servant leadership of the Kamehameha ali‘i, played Makahiki games, and helped clear weeds from the garden. 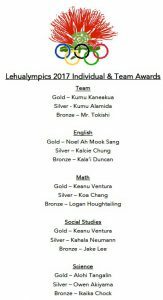 Lehualympics – Each Lehua advisory created a country name, flag and national anthem. 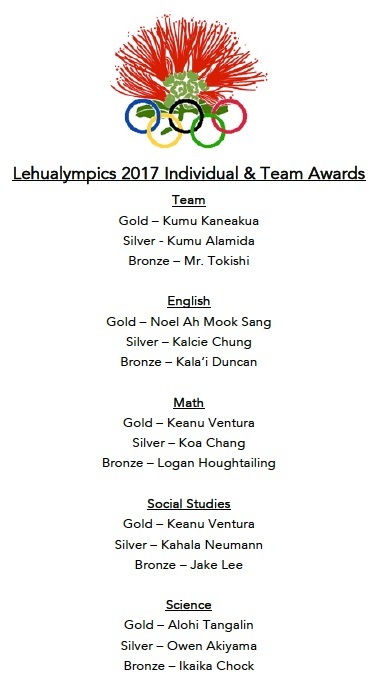 The haumāna participated in an opening ceremony, competed individually in the academic events and with their advisory for the team events. Medals were awarded during the closing ceremony. Science – Haumāna studied lab safety, lab equipment and metric measurements. Social Studies & Language Arts – Haumāna read “Rise of the King – Kamehameha” and completed the “K” for Kamehameha project. Math – Haumāna learned about rational numbers, integers and scientific notation. We believe that learning is a process towards the mastery of standards. As students engage in authentic learning tasks and assessments, feedback is provided for self-evaluation and continuous improvement. 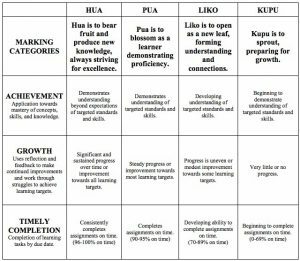 The results of each studentsʻ learning progress are communicated to parents/guardians with the expectation that learning will be a collaborative effort that continues at home. Grades are given to communicate information about studentsʻ achievements in school to parents and others. Grades also provide information to students for self-evaluation. 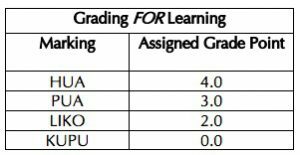 Report cards are issued at the end of each quarter to communicate academic progress, timely completion of assignments, and growth in the learning process. Each of these components contribute to the overall grade in each course. Parents and students who have questions about how the evaluation of a course will occur, should ask teachers to clarify. Retakes: Retakes will be provided for any assessment that ties to our essential curriculum in alignment with our Philosophy of Learning. In order to retake, the student must reflect on how he/she prepared for the original assessment and describe what will be done differently. A follow-up conversation with the teacher will include: identifying what concepts, skills, and understanding will be retaught (e.g. doing assignments, coming in for help, etc. ), agreed upon requirements, and due dates. This reflection and agreement between the student and teacher will be communicated to parents prior to the retake. Retakes are not to be taken for granted. If a student is asking for a retake more than twice a quarter, there may be other problems that need to be addressed (Wormeli, 2016). 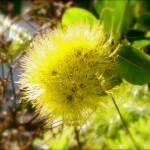 Aloha and welcome to the Pū‘ulu Lehua blog site. Take a minute to browse around our site to familiarize yourself with some important information. On the right under Blogroll, you will find links to helpful sites at KMS, and below you will find a short description about some of the most commonly used sites. KS Connect: KS Connect is an online resource for grades, progress reports, registration, and class schedule and is accessible to students, parents, teachers, counselors and administrators. Access to the site requires a KS-issued account and is password protected. Grades are updated every two weeks. Blackboard: Blackboard (BB) is a web-based classroom management tool. 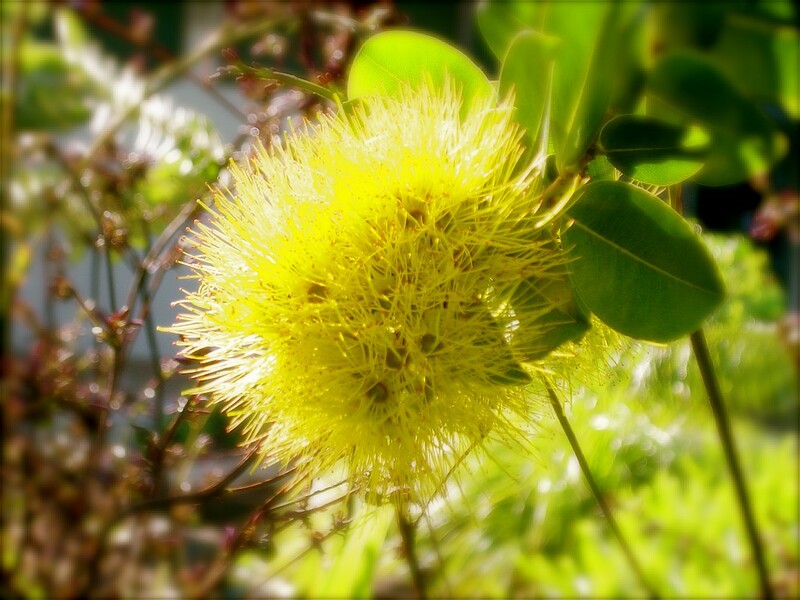 Each core teacher has a BB course and there is also a Pū‘ulu Lehua course. Class agendas, homework, announcements and resources are posted in BB. Handouts, videos, and quizzes can also be pushed to students via BB. Parents have “guest” access to check student assignments. Contact your childʻs teacher for login and password information. Photo Gallery: Enjoy photos of team activities and events Pū‘ulu Lehua students participate in throughout the year. Reminder, photos are intended for educational and entertainment purposes, and any misuse of photos will result in disciplinary action. No posting or using photos without the permission of the student is allowed. See a teacher if you have any questions. Google Classroom: (student access only; no parent access) A secure site for teachers and students that is accessed via the user’s KS Google account. Google Classroom allows teachers to create paperless lessons, distribute assignments, send feedback and see everything in one place. Turnitin: (student access only; no parent access) A web-based tool for submitting assignments electronically. Turnitin provides teachers with an originality report that shows evidence of plagiarism from other student submissions and/or websites. Teacher feedback is given via Turnitin. Take advantage of all these online resources to help stay informed of assignments and classroom happenings. We look forward to an exciting, productive school year! We are excited to share with you what we hope will be a valuable resource. Many of the tools we will be using this year are web-based. We understand that it can be confusing trying to keep track of how to access these tools so we have created a quick-reference guide with descriptions and instructions. Please click on the attachment link below to view and download this guide. *Note regarding KS Connect: If an assignment is listed and no score is visible, it does not mean that the student has not turned in that assignment. It means that the assignment is being graded and a score has not yet been uploaded. A missing assignment will be noted with “mi”.